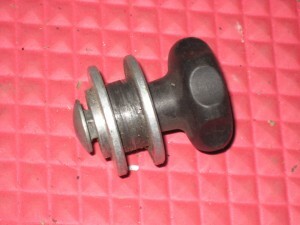 A sleeping hub is a chain keeper designed to replace the hub or wheel when cleaning. 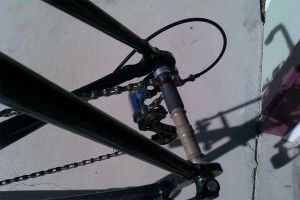 In most cases, a ‘sleeping hub’ is mounted to the drive side drop out and includes a shoulder for the chain to reside. The intent is to allow the mechanic to continue rotating the drive train while preventing the chain from dragging on the frame. 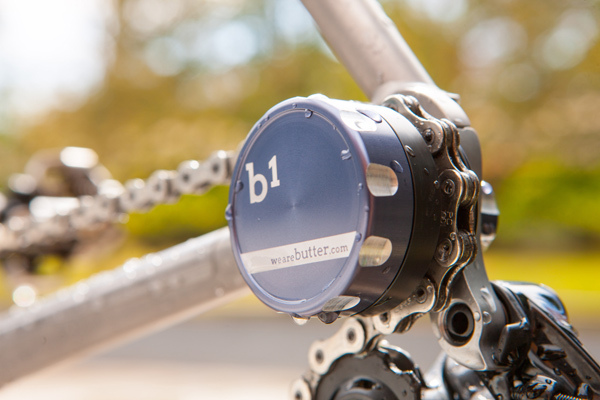 It also provides the mechanic with access to smaller spaces on the bike such as behind the bottom bracket and behind the crank and chain rings. In same cases, these sleeping hubs can also be used when packing the bike for transport. Besides Butter, we have seen sleeping hubs in stores from Morgan Blue, Birzman and Pedros. The Pedros Chain Keeper is one of the more popular due to it’s low cost, availability and ease of use. Are you one of the creative types? Looking for something unique? Try making one yourself. As mentioned above, Calvin Jones of Park Tool has a ‘sleeping hub’ made from the barrel of a revolver. Yes, by revolver we mean hand gun. Many of the mechanics on the circuit are using models like the one shown at right. What about yours? Leave us a comment below with a link to your favorite sleeping hub. Or, send us an image through Twitter. a mechanic at Problem Solvers mounted a pulley wheel on a shortened skewer. Chain Tension Device from Pro – this looks similar to the model from Birzman and includes an adapter to convert from 130 to 135mm. There is a discussion in the USA Cycling Mechanics’ Facebook Group on sleeping hubs where some are suggesting using old hubs so you can shift the derailleur and not derail the chain. Bill McPherson, Bissel Pro Cycling’s mechanic, sent us this image of his custom unit using a Powertap axle and a plastic sleeve from Ace Hardware. Keep us posted on your experience with the b1. How is it for weight? I just bought the Butter b1, myself. Haven’t got a lot of use out of it yet, but it’s pretty sweet, so far.